Tampa’s free app-based shuttle Downtowner is in the process of upgrading their vehicles. Currently, the public company has been provided with three Model X SUV Tesla’s until March and will eventually switch to the all electric Chevrolet Bolt. Previously, Downtowner drove a five passenger vehicle similar to a golf-cart, called a GEM. Comparatively, the Tesla X is equipped with a 17 inch touchscreen display where the downtowner map is presented to the passengers and driver, as well as falcon opening doors that swing up for entry. 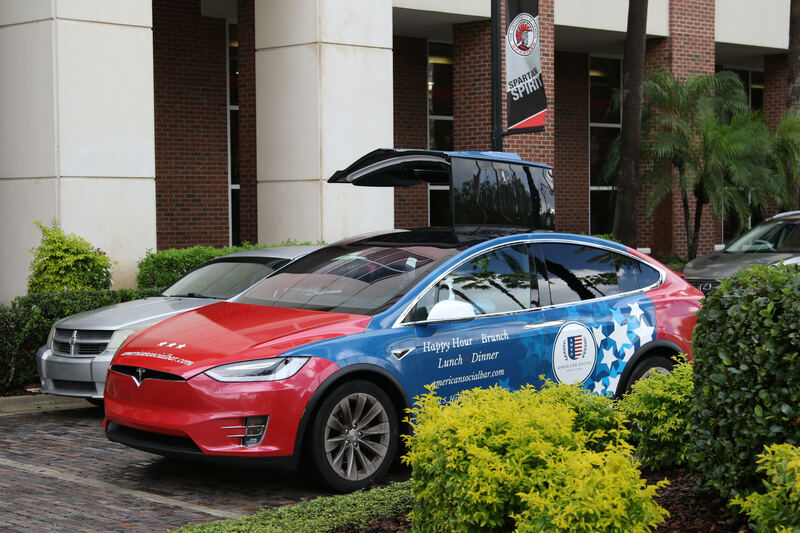 The Tesla vehicles were provided by the Hillsborough Area Regional Transit (HART) at no cost to the program, according to Co-Founder of Downtowner, Travis Gleason. Downtowner launched two years ago in Tampa and started up with the GEMs, but unfortunately the company has faced issues with the carts. They have a lower battery life that requires the drivers to swap vehicles throughout the day, Gleason said . This ate up a lot of time and was difficult during a busy day. As of Aug. 23, all GEM vehicles in Tampa were replaced with Chevy Bolts and Teslas. Since then, the all-electric Bolts have been completing more rides per hour than the GEMs did. Tesla’s also have an extended battery life compared to many other cars, which was a deciding factor for Downtowner. Downtowner services a border within in the Downtown Tampa area, transporting the public to various popular locations. The service area includes the University of Tampa, the Central Business District, the Channel District, Harbor Island and the Tampa River Arts District, which includes Curtis Hixon Waterfront Park, as well as the Tampa Museum of Art and the David A. Straz Jr. Center for the Performing Arts. Despite the launch of the new vehicles, Downtowner has not made any official plans to extend its service locations. Although the service locations have not yet been extended, the service hours were shortened by two hours each day. The hours can be found on the Tampa Downtown Partnership website. With that being said, don’t be surprised if your downtowner pulls up in a futuristic-looking Tesla.